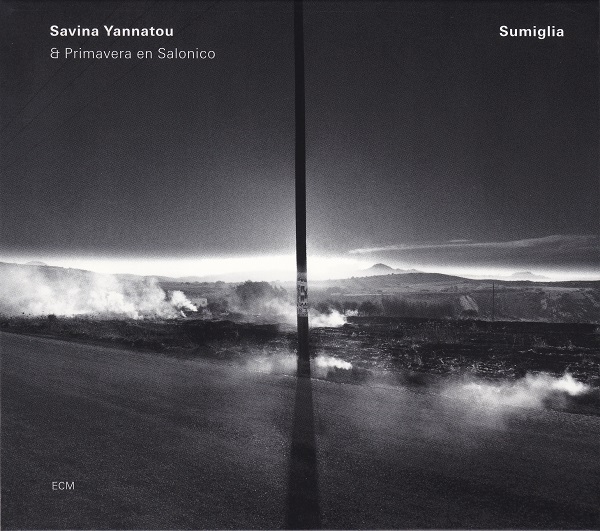 Two years after the release of her ECM leader debut (although really a preexisting live recording repackaged as such), Savina Yannatou returns with her first album recorded under the label’s auspices at Rainbow Studio in Oslo. Sumiglia is at once a departure from and a deepening of the Greek singer’s extraordinary gifts, bound by nothing save her own imagination. Flanked as always by Primavera en Salonico, a band of dynamic expressive power, Yannatou graces another characteristically eclectic program of folk songs. Her voice is like a head of hair: thicker in some places, thinner in others, containing a wealth of reflections and colors, but always rooted and growing. Her wisdom is thus animated, blowing in winds from a thousand isles. In spite of the studio comforts, one experiences Sumiglia as if a live recording, pulsing as it does with only thinly mitigated vibrancy. Like its predecessor, this album begins with a violin solo—a modest introduction that betrays nothing of the ensuing profusions. “Evga mana mou” thus opens with a nod to Yannatou’s homeland, a bridal song of farewell to family and friends. Adopting a tone that is delicate as a butterfly yet sharp as the bird that hunts it, the singing navigates a droning landscape with free surety. Other Greek songs include the tender, spring-like “Yanno Yannovitse” and the beautifully arranged “Ela ipne ke pare to,” which walks with a light kalimba step and a slight Arabic curl, further proving that sometimes the most bone-humming singing is that which is on the verge of fadeout. Within this frame, listeners are whisked away on a carefully sequenced journey. From the droning of Spain (“Muineira”) through the forests of Ukraine (“Ta chervona ta kalinonka”) to the twists of Albania (“Smarte moj”), there’s something for nearly everyone to grasp along the way. Regardless of the roles she adopts, Yannatou remains painterly and self-aware. In the Moldavian song “Porondos viz partjan,” for one, she takes on the voice of an orphaned child, her evening wanderings matched step for step in arco starlight. In the Sicilian “Terra ca nun senti,” for another, she darts through mazes of war-weary angst. Other flybys of the Mediterranean yield the gravelly, fairytale affectations of “Orrio tto fengo” and the whimsical romanticism of “Sta kala lu serenu,” both from Italy. A stopover in Corsica in the album’s title track draws Yannatou’s voice like a thick rope through darkness, heaving histories and mysteries in equal measure. We feel that depth of mourning for times past. The album’s delights take us inland and beyond. “Sedi Yanna,” a well-known Bulgarian folk song, receives an invigorating treatment, with just the exact amount of lilt and forward motion. It is also a perfect representation of the band’s clarity, which despite the density of its execution remains crystal clear. The lyrical fire of “Ganchum em yar ari,” from Armenia, warms us to “Tulbah.” This last is a Palestinian song that shows the Primavera at its chameleonic best. Whether riding the wave or swaying to the rhythm of calmer currents, the band adapts. In addition to its many other virtues, Sumiglia is yet another feather in the cap of engineer Jan Erik Kongshaug. Known, of course, for his spacious treatments of various jazz configurations, here he brings an immediacy that serves the music as much as it serves us. A bravura showing from every angle.